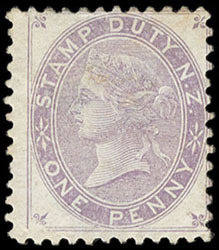 New Zealand, Postal-Fiscal, 1882, 1d lilac, part o.g., strong color, Fine and scarce. SG No. F1 £1,100 ($1,440). 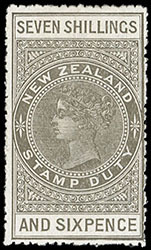 New Zealand, Postal-Fiscal, 1906, 7s6d bronze gray, perf 14, Cowan paper, Single NZ & Star watermark, full o.g., rich bold color, quite fresh, F.-V.F. Scott No. AR39 var. SG No. F84 £1,300 ($1,710). 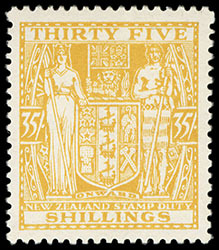 New Zealand, Postal-Fiscal, 1931, 35s orange yellow, Cowan paper, Single NZ & Star watermark, full o.g., rich deep color, choice centering, Very Fine, a lovely mint example of this rare key Postal Fiscal issue. Scott No. AR62. SG No. F161 £5,250 ($6,900). 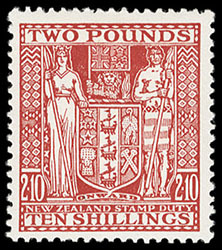 New Zealand, Postal-Fiscal, 1931, £2 10s red, Cowan paper, Single NZ & Star watermark, o.g., lightly hinged, rich deep color, fresh and Very Fine. Scott No. AR64. SG No. F163 £500 ($660). 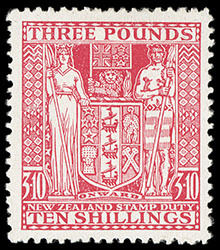 New Zealand, Postal-Fiscal, 1935, £3 10s rose, Cowan paper, Single NZ & Star watermark, Wellington town cancel, bright vibrant color, well centered, Very Fine and choice, a rare key postally used Postal Fiscal issue; with 2012 Odenweller certificate. Scott No. AR66. SG No. F165 £2,750 ($3,610). 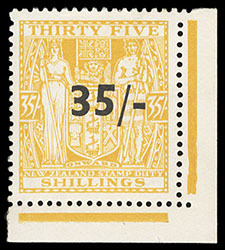 New Zealand, Postal-Fiscal, 1940, 35/- on 35s orange yellow, bottom right corner margin single, o.g., lightly hinged, choice centering, radiant color, Very Fine and choice. Scott No. AR70. SG No. F186 £850 ($1,120). New Zealand, Postal-Fiscal, 1949, 30s brown, Multiple NZ & Star watermark inverted, o.g., never hinged, deep color, Very Fine. Scott No. AR88 var. SG No. F205w £400 ($530). 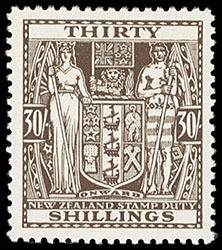 New Zealand, Postal-Fiscal, 1948, £3 10s rose, Multiple NZ & Star watermark, o.g., lightly hinged, rich brilliant color on bright fresh paper, Very Fine, a very attractive example of this scarce stamp. Scott No. AR92. SG No. 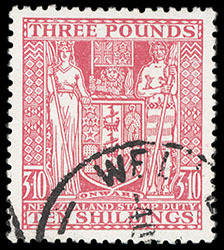 F209 £3,500 ($4,600). 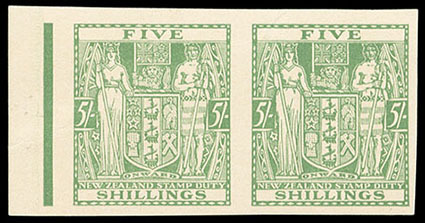 New Zealand, Postal-Fiscal, 1931, 5s green, plate proof on thin card, horizontal pair with left sheet margin, large margins all around; some minor creases, otherwise Extremely Fine. Scott No. AR50P. SG No. F149P Estimate $400 - 600. 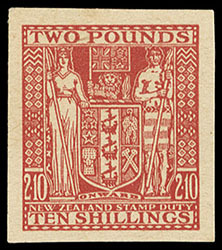 New Zealand, Postal-Fiscal, 1931, 10s carmine lake, plate proof, large margins all around, reverse with two strikes of "Specimen" handstamp, Extremely Fine. Scott No. AR56P. SG No. F155P Estimate $500 - 750.